Jellyfish, that infamous beach threat, is an unusual ingredient and not something commonly found around L.A. You’re most likely to spot the gelatinous, spineless, prehistoric creature that comes in the shape of an umbrella during dim sum service at Chinese seafood restaurants. At ABC Seafood in Chinatown, it’s even on the regular menu, albeit, within a complex stir-fry. Here, you’ll find the cannonball variety. If you’ve never eaten jellyfish in a Chinese restaurant, don’t expect a plate of jiggly, wobbly, mass of slime-like invertebrate to show up. Instead, you should anticipate something that looks more like a vegetable. Imagine a shredded, carefully marinated daikon radish. To get it to this state, jellyfish preparation requires a few steps: it’s salted, sliced, soaked in water, blanched in hot water, and, lastly, seasoned with vinegar, sesame oil, soy sauce, sugar, and garlic. This turns the rubbery mass into a much more appetizing ingredient—and even, for some, a crave-worthy dish on its own. 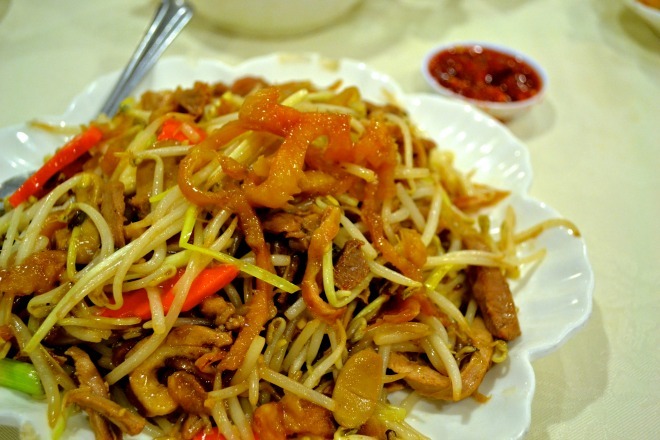 For their signature stir-fry, ABC Seafood combines the aforementioned marinated sea creature with shredded duck meat along with a bunch of bean sprouts, some carrots, and green onion. It’s a collection of pleasing textures. Crunch through the bean sprouts to get to the tender duck; sidestep the carrots to get at the slippry snap of the shredded jellyfish. I’m not sure if this duck and jellyfish plate falls under the category of “surf n’ turf”, but if it doesn’t, then maybe “quack n’ sting” is a more accurate description. ABC Seafood Restaurant, 205 Ord St., Chinatown, 213-680-2887.